We went to "Britain's Oldest Pub" on Saturday. 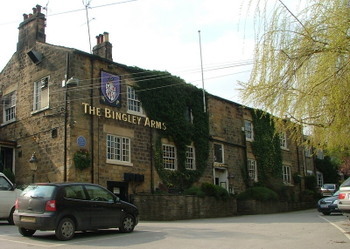 I'm sure it's one of those things that's hotly disputed, but it's listed in The Guinness Book Of Records and there's other evidence too that indicates that this, The Bingley Arms at Bardsey, near Leeds, is indeed the oldest pub. It's proven usage dates back to 905 and as well as its age it's filled with items of apparent historical note that make a visit here worthwhile. And that's before we even get to the food and the beer! The Inglenook fireplace makes a cozy place to sit these days but in the past it was used to hide Catholic priests, there being not one but two priest holes hidden up the chimney (just about visible by virtue of judicious lighting). There's also (apparently) a hidden passageway between the pub and the nearby church by which means the priests could make their way to refuge in the pub. The bar of the pub contains a stove from Kirkstall forge as well as a dutch oven (shown here) that dates from the 1700's, apparently the only one in all of Yorkshire. We ate at the pub, a light lunch of Brie & Cranberry sandwiches, huge, chunky, real chips and garlic bread. It was all very tasty (the chips were out of this world), with decent portions and at a decent price. The hand pulled Tetley's beer was spot on too. The village is small and pleasantly attractive without having too much else to see beyond the pub and the aforementioned church. This church though is a bit of a stunner as churches go, being of an unusual style that looks very attractive. The style comes from the fact that there's an original pre-conquest recangular church (with tower) hidden inside the later addition of sloped extensions. It's obvious from a look at the stonework, and its worth noting that the extensions aren't keyed into the original in any noticeable way. Probably wouldn't pass bulding regs these days! 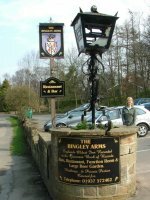 Bardsey village is just off the A58 Leeds-Wetherby road. Sounds good - I'll have to ask my parents if they're familiar with it - not that we ever go round the Leeds way these days. Hope you are have more tasty treats for Easter. We are hiking in Snowdonia and enjoying incredible blue skies and clear views of Snowdon - makes me wish I could climb it again. Long time married, works in computing and watches football!